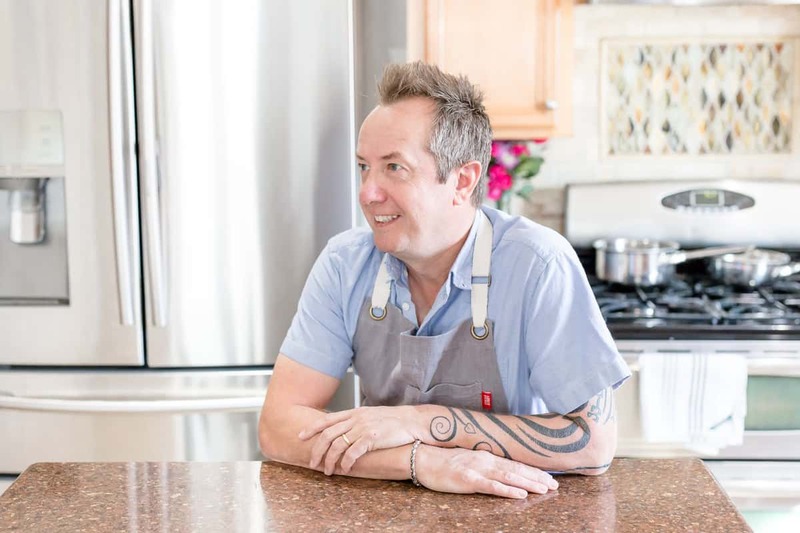 This might seem like a complicated recipe, but if you stick to the steps you’ll be just fine. In fact I think after you inhale it and lick the last splashes of creamy pesto sauce from the plate, you’ll be so glad you made it! Step 1 – Make the amazingly green pesto sauce using spinach and watercress. Yup, there’s still a few leaves of basil to add, but this is spinach driven. Throw the ingredients in a blender and hit the button. 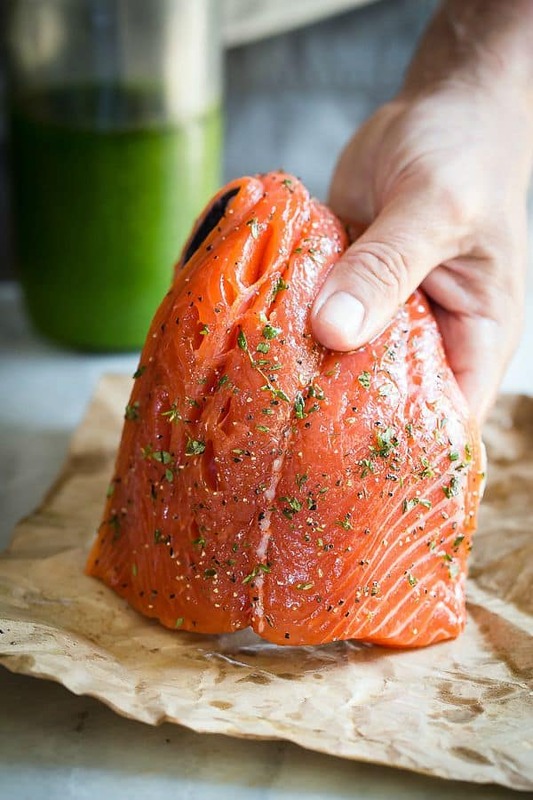 Step 2 – Season your gorgeous deep red salmon filet and bake it in the oven. I used Coho salmon but feel free to use any other variety. Once it’s baked, get in there with your fingers and pull it apart. Toss the skin! Step 4 – Make the sauce, taste it with a tiny spoon just like a real french chef and adjust the taste with some salt and pepper. Take the bright green fresh pesto that you created and add it to the white sauce. Watch it turn into another crazy shade of green. Colorful food is so cool! Step 5 – The exciting part, start telling everyone dinner is ready. Throw the pasta and flaked salmon into the sauce, toss and shower with grated Parmesan. You know what step 6 should be, right? 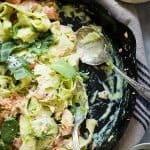 More amazing salmon pasta recipes! an easy weeknight dinner. Pappardelle pasta is tossed in a creamy spinach and watercress pesto. Add some roasted salmon for a great touch of protein. Add the garlic cloves, spinach, watercress and Parmesan to a blender and turn to high. Slowly add the olive oil until the mixture becomes liquid and has no lumps. Season to taste with some salt and black pepper and set aside. Season the salmon with the thyme, salt and black pepper. Place a large oven-proof skillet (10-12 inch) on a high flame and add the tablespoon of olive oil. When the oil gets hot, gently add the salmon filet skin side up. Cook for about 3 minutes and then flip over. Place in the oven and bake for 10-12 minutes. Transfer the salmon to a plate and cook the pasta as per the manufacturer's instructions. In the same pan as you cooked the salmon, add the cream, milk, butter and garlic powder. Bring to a boil and cook for about 5 minutes, It should thicken slightly. Season with salt and pepper and add 1/4 cup of the spinach pesto you made earlier. Whisk the pesto into the cream and taste. Add more pesto if desired. 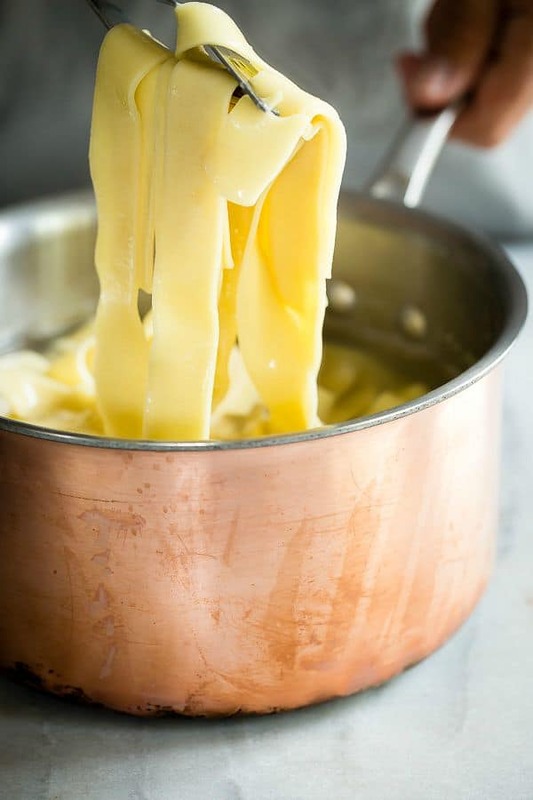 Take the drained pasta and add it to the cream sauce. Flake the salmon with a fork getting rid of any skin that you see. 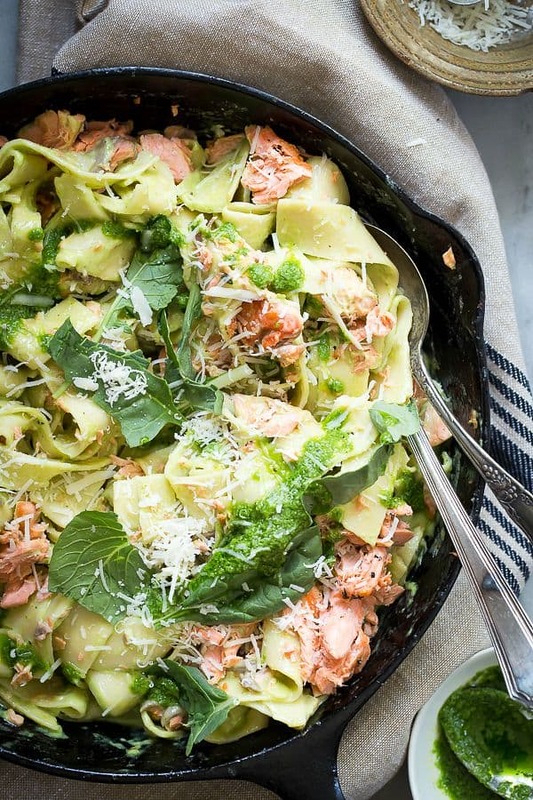 Crumble the salmon over the pasta and toss the mixture together in the pan. Garnish with some more grated Parmesan and spinach leaves. The pesto should make about 1 1/2 cups. Keep any extras in the fridge and use for more pasta dishes. Yes please! What’s not to love about salmon and that brilliant green pesto?! I love all of it Laura! 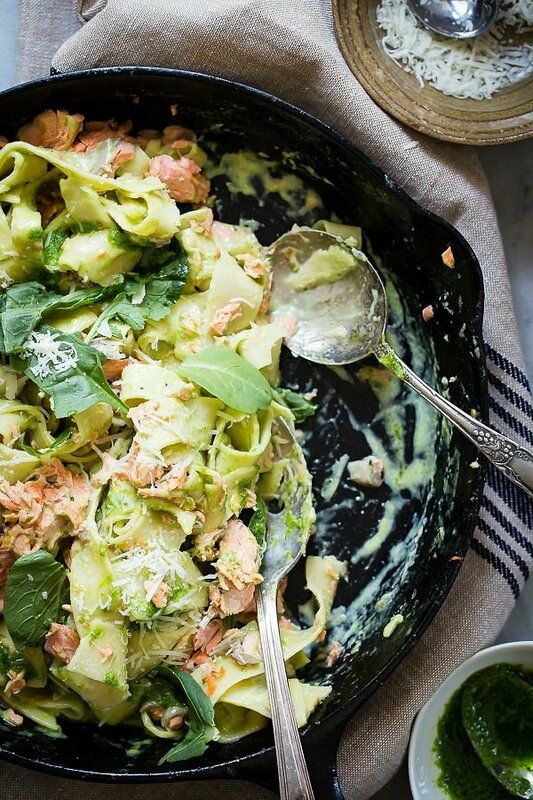 wow the pesto, the pasta, the salmon, it all looks so rich and beautiful, gorgeous and I can’t wait to try this fabulous combo. Gerry, this dish is beyond gorgeous. . love love love the salmon! and pappardelle is my fave! Love the greens – spinach, watercress, basis – awesome. Thanks, Gary. What a fresh, beautiful dinner! Love this combination of ingredients, and that salmon – wow – I could eat that every night – gorgeous! Thanks Jess, It’s a tasty one! Ooooo I have been on a salmon kick lately and this looks heavenly! Salmon and pasta – what could be better?? Me and salmon are BFF’s and this is out of this world beautiful, G!! This is just gorgeous, sharing! This is a family favorite. With one daughter that is vegetarian and one that doesn’t like most vegetables, I can get everyone to eat at least part of this meal. The non-vegetarian loves this pesto better than straight basil pesto and its a great way for me to get spinach in her. Thank you for posting this on Pinterest because I make it often and I am always greeted with happy faces at the table! Awesome Lisa, it tastes so fresh!